As ascending souls, we are living in a unique and wondrous time within our Universe. For it is the first time in human history that we are already dwelling in a Higher Octave within Creation. However, the path to our new dimensional space is not free of challenges - opportunities - for it is in what our human limited self perceives as an obstacle that we find true self-mastery and remembrance of the love that we already are, in Essence. It is precisely at this intense, and at the same time blessed phase of our evolutionary journey, that the deep sense of polarity that humans possess, will increase, being more evident than ever before. For it is a time where, a lot of beings are finally releasing that which cannot coexist with our new frequency, which is often related to their strong sense of polarity, and hence, judgment. This is not meant to slow down our path to a more conscious way of living. On the contrary, this is meant to help us bring unity to what we still believe is separated. To assist us bringing this synthesis, we have a powerful Full Moon at 11 degrees Gemini, opposing the Sun, also at 11 degrees of Sagittarius, a number that is going to accompany us during this New Year 2018 and whose frequency - if embodied properly - will serve us to realize where we still tend to polarize instead of creating fusion between both aspects of Creation. Gemini, the Twins, represent the Yin and the Yang, embracing each other in a balanced and rhythmical dance of Love and unity. Both as individualized beings, but without forgetting unity. Gemini being an air and mutable sign, is mental, intellectual and practical, but at the same time likes to play and socialize, so it is essential to take advantage of this Full Moon and embody Gemini's vitality, at this month, in which, we celebrate not just our Christ Essence, but the love that we, always are, not just for one month. This is a time to be in joy, to love, and to see others as equals, as in Truth, we are always embracing each other in an eternal embrace of oneness, as the Twins do. December with its 22 frequency, as well as with Full Moon in dualistic Gemini, gives us the message of creating inner synthesis - and soul integration - within, and in our physical lives. Gemini invites us to begin first unifying our feminine and masculine essences before we create something new and/or step into a deeper soul reunion with another being, for we cannot truly co-create with another from a place of separation and emptiness, for our relationship will continue to be based on the old 3D values, mirroring our own voids. This is a master number that invites us to master ourselves and relationships, and begins to step away from the 3D old pattern of having relationships based on co-dependence, filling empty voids, and manipulation, for this is far from being an enlightened reunion. Gemini in its individualized but at the same time unified state, helps us remember that within the Divine Plan, we all shall meet and then part again, in a timeless dance of giving and receiving, of embracing and letting all go. It is only our human self who judges what should be and what should not be. It is only our human self the one who thinks that knows best and wants to control all events, conditions and circumstances, never the Unified aspect of us who remembers our True Essence as free Sovereign Beings and sees what is happening behind the physical veils. This Full Moon will mark the end of a micro cycle. It is mean to bring awareness within the aspects of us that still control our life, as it is our egoic personality. It gives us the proper frequency for us to align with it and release all that is still impeding us to blossom into the Lovelight beings that we, in nature, are. Our 3D personality or egoic one, is the aspect of us that - as human - is limited, and hence, it lacks perspective to envision what is truly happening beyond the dense plane in which it resides. When we begin to awake to our true state of being - and multidimensional nature - we also begin to awake our higher, and non-human, senses, becoming One with all the aspects of ourselves. It is this aspect of ourselves that we came here to master and helps us to remember our Divine Essence, not because it is negative, for it is equally Divine, but because it is the one who really needs to evolve, for the soul is already dwelling in the Illuminated Realms of Creation. At this time, it is our task to work with this aspect, for it tends to get attached to situations, relationships and everything that is familiar, even though is not serving our new journey and God Will anymore. All these mechanisms, are often used when we are about to leave a relationship or a certain situation that has not served us for a long time. Our egoic self protects itself for what it considers a loss or simply an attack. To be able to cope with these egoic tactics, the best is to become neutral witness of our human experiences, to be able to discern what is serving us, even if it is painful, but it is showing us something valuable, or what should be dismissed. When we are in a toxic or 3D relationship, our entire being knows. When we cease learning from a certain relationship and all becomes obscure, experiencing a lack of respect and compassion, then deep within ourselves we know that the purpose has been fulfilled and it is the egoic self wanting to remain, at all costs, in this relationship, for this is what it knows, and hence, sees as save and secure. Yes Beloveds, even though it is hard to recognize the Truth to ourselves, our soul, the aspect of us who never sleeps, who is always One with All, knows when it is time to leave. It is your choice to remain or to finally take this step, but the more you foment separation from your true soul desires and nature, the more you will feed your suffering. When we finally let go, a part of us may be in deep pain, but it is precisely by letting go and accepting the pain that we can finally begin to liberate ourselves from our actual cause of pain, which is nothing but remaining attached to something/someone who is no longer aligned with who we have become instead of naturally letting go. There is, always, a voice deep within yourself, whispering what you need to know, at every single moment, listen to it, move within and let it speak, it is safe, it will not hurt, for Truth never hurts, it only frees you from the egoic chains in which you tend to put yourself. Yes, we always know when the moment to say our farewells has come. We may cover our true feelings with past nice memories to make it nicer, to make it alive again, we may dwell for a while in denial, but the Truth shines so bright that we can never lie to ourselves, we can simply make the huge daily effort to convince ourselves that where we are, even if painful, is where we must be. I chose to free myself from everything that was not meant to be in my path, at this time. But in the past I also chose to stay in painful situations, for I am human, I am not perfect, and I am not ashamed to say it, this will not make me less evolved or more, simply as I AM. You have, at every single moment, the strength and the Power to deal with whatever situation that is affecting your current path, impeding you to dwell in the timeline that you truly desire to stay. The choice is, always, yours to make, and the time in which you make your decision, will always be the perfect time for you and All. 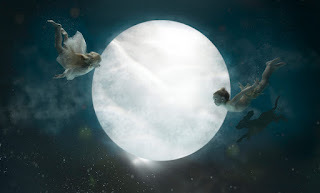 This Full Moon in Gemini, as I received, is meant to bring awareness, in what we are still reluctant to put an end into, as well as in our deep sense of polarity, for even if there are two poles within our Universe, all is, always, One. Gemini will bring the opportunity for us to see where we still remain in duality or where we choose separation, whether within ourselves or without. Our relationships are our main masters for they show us aspects of ourselves that are not yet loved and embraced and/or where we still keep feeding old ways of being. At Full Moon time, we have two important cosmic events, making of this Gemini’s Full Moon more Neptunian than a Gemini one, as the Moon square Neptune, the Planet of Dreams and Intuition, together with the Sun in another square to Neptune. On the other hand, we also have an important trine between Jupiter and Neptune. These aspects will function as a catalyst, especially in the collective, to expand their higher channels as well as on the healing that first they shall do to function from a unified perspective and for the ones who have already done so, to expand on new healing abilities to assist others. The Moon and Sun squaring Neptune, will trigger delusions in all aspects of our lives, it will assist us to see where we are still delusional about ourselves, lives or relationships and will help us to move beyond our fixed illusions and begin to embrace a higher perspective on where we are and what we need to dissolve all human illusions. Jupiter in a trine to Neptune will be a cosmic blessing for us to expand on our creativity, higher senses, unconditional love and compassion, as well as the many revelations that being in this state of being will bring us, if we know how to direct our inner visions and use them to restore ourselves and lives, according to a Higher Power and not to our egoic one. This is a time of Truth, one that shines so bright that can never be dimmed or hidden. This will also help the ones who are still on a soul quest, discovering their soul mission and true soul desires. This is also a time to have faith and trust in what is meant to be, in what already IS and in yourself. Do you only have faith when things are happening according to your egoic expectations? Or do you hold faith even in the hardest of times? Do you only live in joy when all is heading in the direction you consider to be the right one? Or do you bless whatever comes your way, knowing all is going in the proper direction, for you and All? Faith, hope and joy, are our natural state of being, outer events, as it is Christmas, or what may come with it, are illusions we created to cover the silence, in which we could find all the answers and solutions we still await from these outer events. If you are not in bliss, no matter what is happening outside yourself, it is because you still depend on others or outer circumstances to make you feel in joy, forgetting your inner power to transform your egoic feelings and feel at peace again. This cosmic union also brings the perfect frequency for us to embrace new ways of healing, for even though I respect the old ways of healing - such as Reiki and so on (I am myself a Reiki master) - where we are heading is a sovereign realm for empowered beings who use their own inner Force/Power to heal in their unique way, not in the old ways that served for this specific time but that with the new frequency we hold right now, no longer serves our journey. I share my guidance and view of healing, with great respect to All. I am not saying this is bad or lower or anything like this, I simply found myself that all these old methods are obsolete. When I began my healing journey, and embraced the healer we all have within, and began to heal in my unique way. For we all have our own unique ways to restore what the human tend tos manipulate and destroy, and as energies as well as ourselves, are constantly shifting. I found out that old healing methods were there only to remind us that if others have done it before, and descended their own healing tools, we are also Sovereigns Beings, capable of doing the same, and this Full Moon is going to be a precious time for us to find the inner magician and healer, within. It is a season to end an old cycle with the joy and gratitude of recognizing the precious opportunities that the old provided for us, for without experiencing all we had, we would not have been able to complete this step of finally releasing the familiar and embracing the unknown. For it is when we finally disengage ourselves - from our egoic desires - and open our hearts to a higher Will ~ miracles begin to happen. Suddenly, we are relocated where we desired, we begin the relationship that is aligned with who we have become, abundance flows infinitely, and all that we ever desired becomes real. Why? Because we have finally become One with our True and Higher Purpose, and hence, God Self, allowing it to work through us, putting ourselves exactly where we need to be, offering us the situations and the soul encounters that are meant to touch our lives, at this time, and it is then that everything seems to fit into our new reality. Surrendering and becoming One with our soul mission and the true purpose that lies behind our human desires, is what offers us the gift to finally stop suffering and embrace the joy that this journey also brings. When we follow only our egoic desires, as we cannot control reality or anyone else, we tend to be constantly suffering, because of the constant draining energy that wanting to manipulate reality has. However, when we finally declare our pure will and intention to co-create only with the Forces of Light, only with our true soul desires and follow not our will but the Divine Will, is that everything begins to work in our favor, for everything that occurs, independently of its nature, will always be perfect for us, as we no longer expect a certain result, or want things to happen in our way. For we now embrace all as equal, and as a blessing. Transcending polarity and hence judgments and the fixed human perspective of what is "good" or "bad" is a personal choice, when one sees everything with a Divine purpose behind it, one knows that no matter the outcome, all will benefit us/All, for everything is Divine, and God is, always, unconditional love in motion, taking care of All within Creation. Make your choice, the decision to keep seeing all as a curse or as a blessing, as it is in Truth, at all times, is there for you to make.